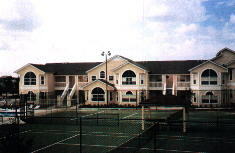 Villas at Island Club is a 220-unit rental condo community located 4.5 miles from Walt Disney World, just off Route 192 on the quieter West side of Kissimmee. It is off the elegant Lindfields Boulevard exit, less than a mile from Disney's new Western Way entrance on the 429. Getting here is a snap. It is just off the popular West Irlo Bronson Highway (or 192). It is less than two miles East of US 27 and five miles West of I-4. Use this link to find us on Google Maps. And if you prefer Yahoo! Maps. . .
Villas at Island Club is a 5-7 minute drive to Disney's Animal Kingdom, a 10-15 minute drive to Disney-MGM, EPCOT and Magic Kingdom and 20-25 minutes away from Universal Orlando. It is about a half-hour drive from Orlando International Airport. Just follow the instructions to Disney from the Airport and get off the 192 Westbound exit at 192 until you pass Mile Marker 2. Lindfields Blvd is on your left and Villas at Island Club will be the third entrance to your left. It's a choice location as you are just minutes from the parks and nearby great shops and restaurants but without the bright lights and noise you will find on 192 to the East of Disney.